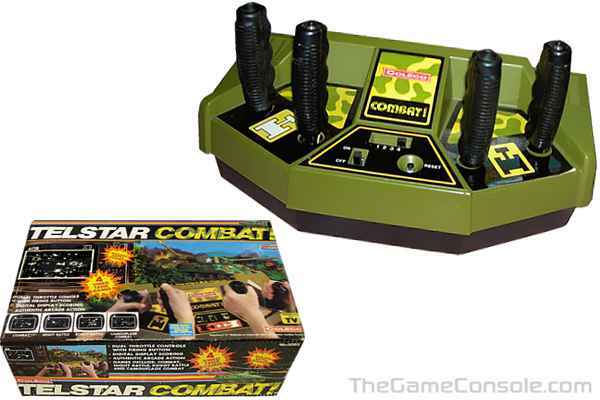 The Coleco Telstar Combat! game was released in 1977 as a post-Pong dedicated video game console. Unlike Coleco's earlier home Pong games based on the General Instrument AY-3-8500 chip, it used a AY-3-8700 chip. The console was a modest success but due to having too many similar dedicated console products, Coleco nearly went bankrupt in 1980. Telstar Combat was one of Coleco's attempts to break away from the Pong game video game rut. It's certainly unique, no other company manufactured a dedicated console with such elaborate controls. The console plays four variations of a tank battle game, very similar to the Atari 2600 Combat game cartridge.